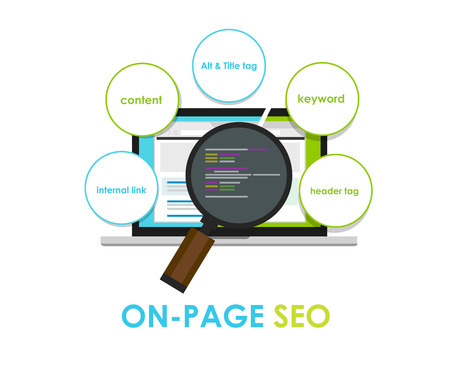 On-page optimization is the process of improving a webpage’s content along with other technical aspects to increase the website’s ranking position on search engine results pages. Working on on-page allows you to optimize your website for certain keywords that are best used by online users who search for your business. Here are a few things you should consider focusing on to make sure you have optimized each page on your website according to the best practices for SEO. Title Tags: every page should have an HTML title tag that contains the target keyword and should not exceed 70 characters in length. Title tags help the search engines understand what the web page is relevant to, considering the keywords in the title itself. Meta Description Tag: search engines don’t find meta descriptions a very important factor for SEO however it’s always good to have since it can serve as space for marketing your brand. The description appears right underneath the title of the page when it is listed on the search engine results page. It should contain your targeted keyword and can take up to 160 characters in length. Image Alt Text: short form for alternative text, is used to give Google a good idea as to what is on the page as well as the surrounding text. Placing at least one image on your page with a good image alt text that contains your target keyword will help you in your ranking on search engines to relevant search queries. Content: there are many factors associated with creating content for your website such as goals and keyword research. A defined goal can help you in creating the content best suitable for what you’re trying to achieve. For examples, copy for a product would have content with a more salesy kind of tone whereas an informative website would have a more formal tone. Keyword research gives you a good idea as to where and how to use the keywords in your content before you start your writing. This helps in knowing how much search volume each keyword has and what sort of value it will add on to your content. Links: internal linking (links from one page to another page on your site) helps search engine crawlers understand the site architecture of your website as well as spread the link equity (generated by good quality content and proper on-page optimization). There you have it – a rundown of what on-page optimization entails and what you should focus on. Liked what you read? For more information on how SEO can be beneficial to your business, or for a free consultation, contact us for a one-on-one meeting with a consultant!